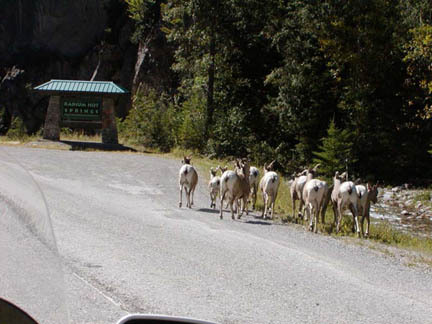 In September of 2005 we took the scenic route to Nelson, BC. 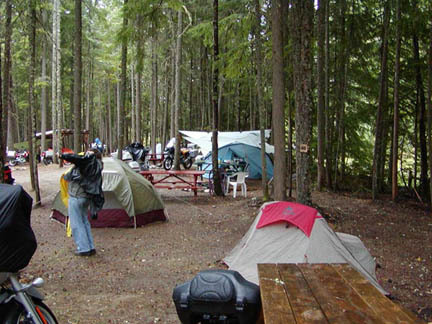 The main purpose of this trip was to attend the Horizon's Unlimited Rally in the Toad Rock Campground near Nelson, BC. We went east through the Snake River Canyon, the Sawtooth Mountains, the Salmon River, Glacier National Park, Edmonton, AB, and the Icefields Parkway on our way there. 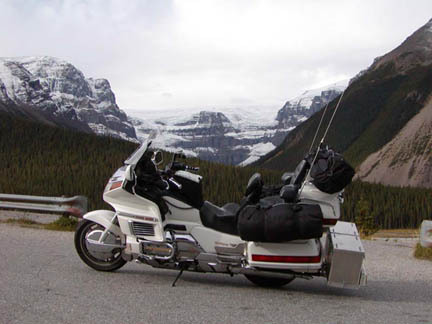 The weather was good all through Idaho, Montana and southern Alberta. When we arrived at our friend's house in Central Alberta, we hit thunderstorms, but we were indoors then. They are not only GoldWinger's, but horse people. The women stayed indoors, but Dave and I went for a ride around their property on a couple horses. After a couple days there we went to the Royal Museum near Edmonton for their display of motorcycles. It was the Labor Day weekend and also Alberta's 100th birthday. The museum had a farmer's market and an antique steam tractor show going on too. 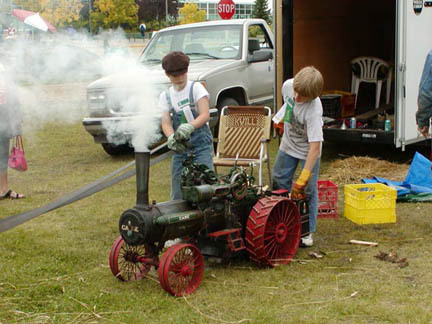 These two boys had a working model of the steam tractor dad was running, complete with a working grain thresher on the other end of the belt. We spent the next day (Labor Day) in Edmonton visiting the mall and Fort Edmonton. The mall is huge with an indoor waterpark (5 acre lake with surf), an indoor amusement park with a tall roller coaster, and in the middle of the mall, in the aisle between the shops, is a lake with submarine rides, dolphin show, peddle boats and a full-size mockup of Columbus' ship, the Santa Maria. Fort Edmonton is a replica village of Edmonton's historic buildings divided into sections by date with people in period costume, the original fort, then 1895, 1905, 1925. Because of the holiday and anniversary admission was free, and the place was full of visitors. From Edmonton we went to Jasper and followed the Icefields Parkway south and then we went southwest to the Toad Rock Campground for the Horizon's Unlimited Rally. We arrived a day early, on Thursday, and helped Grant (of Grant & Susan, who own Horizon's Unlimited) set up for the rally. That evening we went to a nearby hot spring and proceeded to cook ourselves to medium-well-done. The next morning it started to rain, and continued thru the entire rally. It did dampen some spirits, some people went to nearby motels. We toughed it out because we were testing our gear that we have bought to take to Europe. On Sunday, as people left, it stopped raining. We headed south thru Spokane, Washington and southwest to Oregon for the night. It was dry and sunny and we laid out our wet tarps and opened up the tent and sleeping bags to dry. The following day we arrived at home. We reviewed and discussed the gear. In general we will keep all but some minor pieces, but I need to move some weight forward. Nothing of any big problem. It was a successful and fun trip.